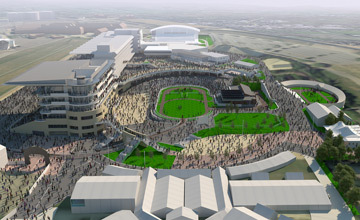 BUSINESSMAN and racehorse owner Martin St Quinton is to chair the committee set up to oversee the financing plans for the Jockey Club's £45 million development at Cheltenham. St Quinton, who is vice-chair of Gloucester Rugby Club and a non-executive racecourse committee director at Epsom, will be joined on the committee by Cheltenham's chairman Robert Waley-Cohen, Ian Renton, who is regional director for Cheltenham and the south west, Sheila Handley, finance director for the region, Jockey Club chief executive Simon Bazalgette and Jockey Club Racecourses managing director Paul Fisher. The Jockey Club has raised almost £25m of the £45m cost of the development through its recent Racecourse Bond with the remainder to come from cashflow, bank loans, potentially a debentures scheme and other commercial arrangements..
St Quinton, who has enjoyed Cheltenham Festival success with Monkershostin, Coulton and Urubande, said: "Not so long ago, to raise funding for this type of project you would only turn to your bank. But today's climate is different and we are now seeing highly innovative and effective new ways of financing being explored and created. "I'm delighted to lean on my experience in business and finance to work with the Jockey Club funding committee on the funding of this highly prestigious development and we have got off to an excellent start as a result of the Racecourse Bond offer being highly successful. "As far as jump racing is concerned, Cheltenham is the centre of the universe and we are determined for facilities to match its hard-earned standing within British sport through this exciting project." The project, to create a new grandstand in place of the 1920s A&R' block that contains private boxes and the Royal Box, is due to start after the 2014 festival and be completed before the 2016 meeting, subject to planning permission.